â¥Natural Inspirationâ¥ Inspired by the Alpine lakes, the reflection of glacier winds on the azure lake, itâs magnificent and expansive, which expresses the designer’s feelings to the nature. 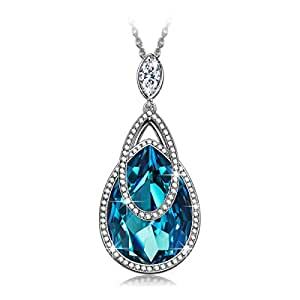 By using Swarovski Aquamarine water-drop crystal as a microcosm of lake, this necklace is glittering and translucent. It is the most poetic gift for your mother, lover, or friend. â¥Best Matchingâ¥ The Pendant Necklace features a water-drop shaped crystal framed in clear crystals pave, add the matching drop earrings to create a stunning ensemble. â¥Crystals from Swarovskiâ¥ âAlpine lakesâ Necklaces are made with Swarovski Crystals. Environmentally friendly material Zinc Alloy Chain, Lead-Free & Nickle-Free, passed Swiss SGS Inspection Standard, Not harmful for your health. â¥Perfect Gift for Herâ¥ Each pendant necklace Comes with a pretty gift box. You can give it directly as a gift to your lover, wife, girlfriend, daughter, granddaughter and your friends on Mother’s Day, Christmas Day, Valentine’s Day, Anniversary Day! â¥Trendy Crystal Jewelryâ¥ J.NINA is Trendy Jewelry Brand. Every jewelry has its own design soul and character – Incredible sparkle with every moment. Those who have it love it! Packs each jewelry with a deluxe jewelry gift box, absolutely a great choice for gifts that any lady would enjoy receiving, of course, it’s also a great gift for yourself. â¥Keep it dry and avoid wearing it when bathing, doing housework and swimming. â¥Perfume is also corrosive to jewelry. Wear your perfume before putting on the piece. â¥Do not touch it often, grease and sweat on hands will caused corrosion. â¥Rub your Jewelry with baby wipes: they perform miracles on crystal jewelry. Then rub with a clean dry soft cotton cloth to bring back the shine. Put it inside a soft cloth pocket or fabric swath, avoid it from rubbing against other jewelry. You could click on“J.NINA JEWELRY” to see our other jewelries, there are more affordable and beautiful designs for your choice. Thank you.